Guitars that look like they have been on the road for years are now part of most leading manufacturers catalogues. Scratches and scuff marks created through years of hard playing are replicated in the workshop with a few tools and a good eye for detail. These off-the-shelf distressed models can be expensive though, so if you want the reliced look without the price tag you can achieve the same effect yourself with some everyday readily available tools and materials. Prepare the guitar for the work by removing the strings and hardware. Throw the strings away and set the hardware and any screws aside in a safe place to deal with later. Create signs of abrasion on the body using sandpaper. 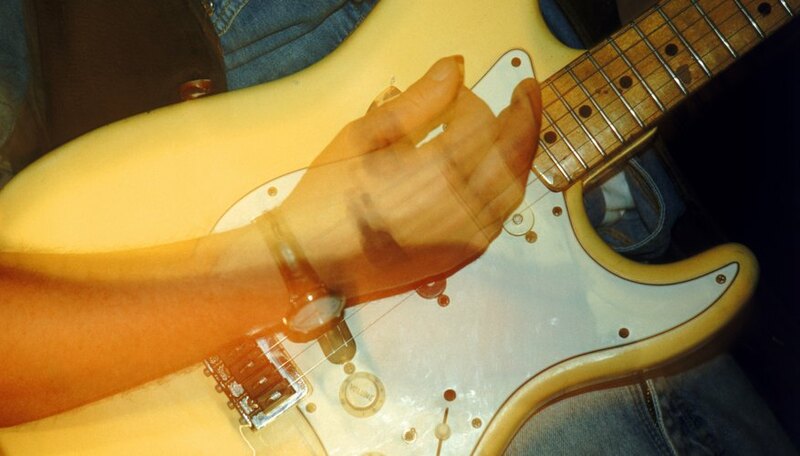 Study pictures of famous road-worn guitars to identify the areas of greatest wear. Normally this is where the player's arm or the pick comes into regular contact with the body. Focus on the top arch of the guitar, around the bridge, above and below the strings and at the cutaway. Make some impact damage with a screwdriver, a small hammer or some other hard metal objects like a bunch of keys. Don't forget to apply some "buckle-rash" on the reverse of the body to replicate where a belt buckle constantly rubs. Heat the guitar's body with a hairdryer on the highest setting. The heat causes the body to swell slightly. Cool the heated area rapidly with the compressed air to crack the lacquer finish. Repeat this process on different areas to get the kind of even, cracked appearance common on old guitars. Bring some shine back to the body by buffing evenly with a soft pad attached to a power drill. Don't overdo this step as genuine vintage guitars rarely have a high-gloss finish. Work the pad just enough to even out the damage you have inflicted. Roughen up the hardware and introduce some impact damage by bashing it on a hard, concrete or stone surface. You should not attempt to distress the bridge assembly as this is a carefully calibrated part of the guitar. Any damage to the bridge may impair its performance and so the playability of your guitar. Be careful not to actually damage the funtionality of the other pieces of hardware. Rub the hardware with some fine grade sandpaper to break though the surface of any plating then place it all in the large bucket. Put on your protective goggles and gloves. Pour a little of the hydrochloric acid into the small bowl and place this inside the large bucket. Secure the lid and leave the bucket in a safe place away from children or small animals for up to 48 hours, though you should check progress occasionally. The acid vapor will get to work on the metal without having to full immerse them in the acid. Remove all the parts once they have become distressed in line with your overall desired effect. Wear the gloves and goggles to do this. Carefully return the acid to its original container and return it immediately to a safe place. Rinse all parts with water then lay them out on an old towel or some paper towels. Spray lightly with WD-40 and allow to dry. Polish the parts gently when they are dry but be careful as some of the remaining finish might flake off if you're too thorough. Refit all the parts to your guitar body, and restring to get rocking. Acid is dangerous -- always work in a well-ventilated area away from small children and animals, and always wear protective goggles and gloves.